My good mate Darren has the “Daddy” of all Cable Testers. It’s a Fluke something-or-other and it’s amazing! It can ping IPs, generate network traffic, test bandwidth , tell how long your CAT5 cable is, how many metres down the cable the break is (if there is one) and even the date and time the cable was manufactured (ok…I made that last one up). The only problem with this hand held wonder is that it’s the same price as a small farm in Donegal! Atlas – With all the cable in our house I’ve always wanted a CAT5 tester. I don’t need all the fancy stuff, just a simple tester that would give me straightforward information on my cables which are all already terminated into patch panels. Using The Atlas – The Atlas is pretty idiot proof. Take one of the little dongle terminators from the package and attach it to one end of the included CAT5 patch leads. The other end of the lead is plugged into the patch panel or RJ45 wall socket. The Atlas is plugged in at the other end. Hit the TEST button, simple as that. The Atlas automatically identifies the cable type it’s connected to and verifies all the connections. With the 2 patch leads and 2 terminators included in the package it’s possible to test cables which are plug to plug, plug to socket and socket to socket. Improvements – One thing that would be a nice addition to the package is something that would allow you to connect it to cables that have not been terminated already. Something that you could push or clip the loose ends into to allow you to quickly connect a bare cable to the Atlas. Update – Peak have just announced a new “ID” feature for the Atlas! 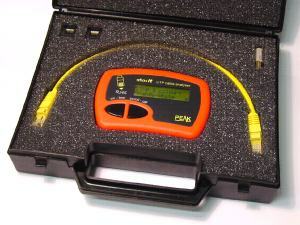 Be the first to comment on "Atlas CAT5 Cable Tester – Review"